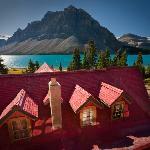 The lodge overlooks one of the most dramatic scenes in the Canadian Rockies. From Bow Lake the mountains rise steep and rugged. The blue ice of Crowfoot Glacier is suspended over the turquoise water.